It's always great to see an existing client take big steps toward growing its business -- but, it's even more exciting when we get to help! Viget continued our ongoing partnership with MetaMetrics, a Durham-based company whose mission is to improve education through linking assessment with instruction, to expand its Engaging English® reading service. 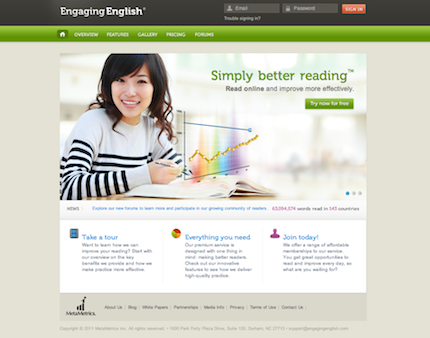 Engaging English uses the Lexile® framework to measure the reading skill levels of English-language learners, connect them to reading resources that match their level, and then track their progress. We teamed up on the Engaging English product not too long ago, providing UX, visual design, and front-end development services. However, at the time, the "marketing" arm of the site was simply a one-page login screen with a brief product tour. Memberships were only available through a partnership with Educational Testing Service (ETS), so on-site marketing outreach and e-commerce weren't needed. But, the time has finally come for Engaging English to expand and offer its own e-commerce! Now that users can join directly through the site, the Engaging English landing page needed to transform into a full-fledged marketing experience. MetaMetrics came to us with a clear vision for the information architecture and page content, and we jumped in to refine page layouts and tackle visual design. The look and feel is consistent with the existing brand and style of the Engaging English product, but we also added interest through compelling homepage panels, fun iconography, and conceptual header graphics. In addition to the new marketing site, Engaging English also introduced a new user dashboard, which gave us the opportunity for user experience collaboration with the MetaMetrics team. It's an exciting new addition to the product! This was just one step in our ongoing partnership with MetaMetrics. 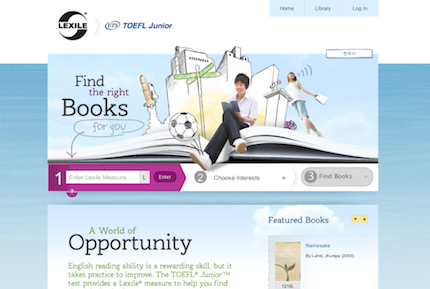 Over the past year, we've pitched in on a couple efforts -- most prominently Lexile.com's TOEFL Junior service to match readers with books that suit their skill levels and interests. This site applies much of the logic from Engaging English to help a younger demographic measure reading progress. Congratulations to our friends at MetaMetrics on the successful launch of the new marketing site!